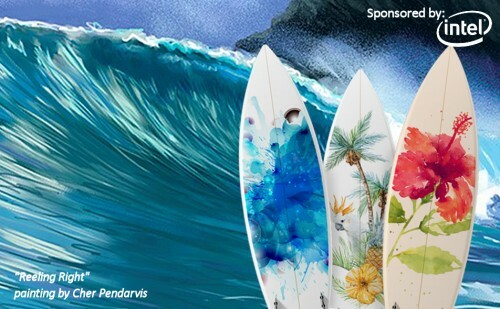 Quoted from the Corel site: “If you haven’t entered our Catch a Wave surfboard art contest, what are you waiting for? We have some amazing prizes up for grabs, including a custom, hand-built surfboard with your design printed on it, Microsoft Surface Pro tablets, solar chargers and gift cards, sponsored by our friends at Intel. Perhaps you’re wondering “how do I create a design for a surfboard?” Well, it’s easier than you think. There is no set template to follow – just let your creativity and inspiration be your guide. The thrill and exhilaration of riding a wave, combined with the surreal and spiritual experience of being one with nature make surfing more than just a sport – it is a lifestyle that combines freedom, joy and inspiration like no other. So we are challenging you to use this inspiration to create your own surfboard artwork. Any digital art that you create can be used on a surfboard. If it is something simple, like a dolphin, fish or seahorse, it can be placed in one spot on the board like the deck or nose area. More detailed and complex artwork like an underwater scene or sunset landscape with palm trees can be placed to cover the entire length of the board. Wherever your inspiration takes you, we will work with the winning artist on how to best place his or her design on the board. You can read the full story and find out the contest information details at this link! No Comments on "Want to Win a Custom Pendo Surfboard?"